WITH snow like fine powder, the Sierra Nevada is a Mecca for thrill-seeking snowboarders. For beginners and experts alike, Spain’s highest resort is a glorious setting. Stunning scenery is matched by the top-class facilities, which saw the resort host the 1996 Alpine World Ski Championships and could win it the Freestyle Ski and Snowboard World Championships in 2017. Novices should head to Borreguiles where 22 lifts deposit snowboarders on a gentle gradient where they can hone their skills. 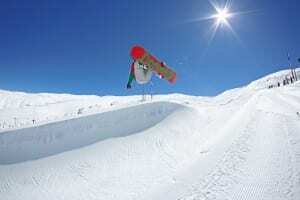 The Sierra Nevada is also home to SuperPark Sulayr, Europe’s largest freestyle snowboard park. Now relocated from Loma de Dilar to an altitude of 2,700 metres on Borreguiles, Spain’s most famous snowboarding park also houses the country’s biggest permanent half-pipe. Measuring an astonishing 165 metres in length with a height of six metres, the special design flattens the snow on the side of the half-pipe so boarders can jump on both sides. This season, the park’s advanced line (L) offers riders two railings of 5+5 metres with a jump of four metres, while the intermediate line (S) ends in a jump of two metres. An airbag is on hand to ensure a soft landing. I was up there a few days ago for a new years bash and there is no significant snowfall to speak of. This may change of course, but skiers should check before departing to avoid disappointment.